In the retail business of woman clothing, any Retailer’s job is to offer various types of dress material to customers. To establish a successful clothing store, a shop keeper should be superior at staff management, product knowledge, and Competitive wholesale market. Above all, a person must have information regarding the quality of dress material since there are high and low priced fabrics available in the wholesale market. 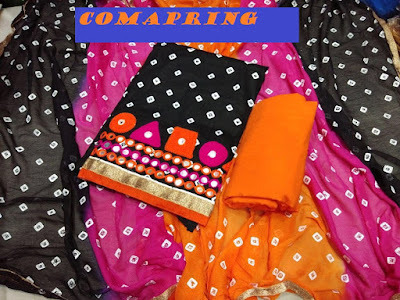 In purchasing of off-the-rack salwar suit, a label is there where a retailer can find all the details about fabric but he/she can get the same detail in when they buy wholesale dress material catalog. That is why it becomes necessary for each individual retailer to know the inside detail of fabric to pay the right wholesale price. This post is all about the information that is needed to identify the superior quality of dress material at any wholesale market so let’s start. These are some simple methods which can be applied to check any type of fabric but to inspect each different fiber; there is a different procedure that we discuss in our next article. So first understand the basic and then go for detail inspection. When you are at the market and you are looking to buy wholesale cotton dress materials then compare it with cotton. You can ‘t compare two different fabrics as Your focus should be on Cotton no matter it is plain or printed but you can’t compare cotton fabric with Georgette with satin. A key thing to observe the pattern is to touch the design works as the wholesale dress materials is not only manufactured with using plain or printed patterns but also designed with various kind of threading work. Hence Just Scratch the embroidery work by nail to check the dependability of it, by doing this scratching test you can have a fair amount of idea about the stability of any kind of decoration. If the threading is coming out from soft scratching than it simply means the particular dress material is not resistible and not good enough to handle even one or two washes. One stare is not enough to check the printed patterns as there may be manufacturing errors on dress material. To identify printing errors, a retailer has to have a close look at fabric, check the shade, compare two different dress material pieces and you can easily rectify errors. A Great idea would be to check out the fabric is to crumble and that is how you know how long the wrinkle stays on dress material. If it stays for more than 10 seconds than the quality of the fabric is not reliable, don’t buy a full catalog of such dress materials. Another great way to test the fabric dependability would be to Pull gently from both sides, just hold it with both and pull it. The lower quality dress material can easily pop out the broken thread when you apply this test. We believe that by applying the above techniques, any bulk buyer can easily identify the features of the dress materials at the wholesale market. Even The manufacturer of dress material can also perform the quality test at a production house with the help of these techniques.